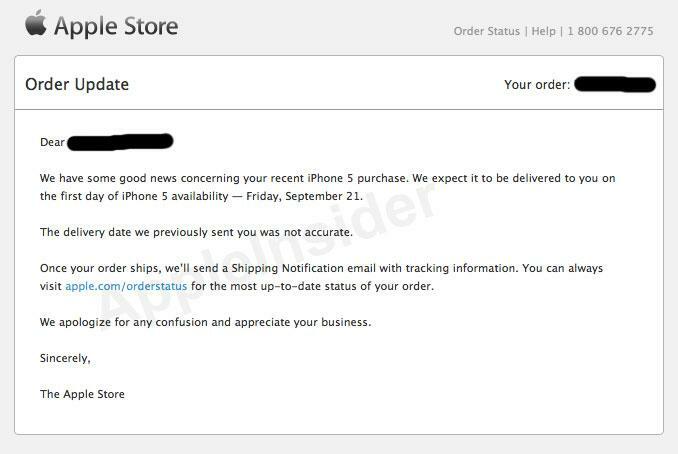 Some early iPhone 5 orders may ship sooner than was originally advertised, based on an e-mail sent out by Apple. One AppleInsider reader received a note from Apple letting them know that their iPhone 5 will arrive sooner than expected. When the order was originally placed Friday morning, this person was quoted an arrival date of two weeks. "We have some good news concerning your recent iPhone 5 purchase," the e-mail from the Apple Store reads. We expect it to be delivered to you on the first day of iPhone 5 availability  Friday, September 21. The delivery date we previously sent you was not accurate." Just over an hour after preorders of the iPhone 5 began early Friday morning, Apple's online store began quoting customers an estimated shipping time of two weeks. Apple responded and said officials were "completely blown away" by demand for the iPhone 5. As of Saturday afternoon, Apple's online store indicates that all iPhone 5 models are available to ship in two to three weeks. The device will become publicly available next Friday, Sept. 21. Apple's carrier partners are also selling the iPhone 5 at launch, but AT&T and Verizon completely sold out of their launch-day inventory on Friday as well. Those who missed out on preordering an iPhone 5 for launch can still attempt to buy Apple's latest handset at a brick-and-mortar store for Friday's launch. Apple's own retail stores will begin selling the iPhone 5 at 8 a.m. local time, while carriers and retail partners such as Walmart, Radio Shack and Best Buy will have inventory.